On Monday 9 July, LSN ushered in a new era of London networking events with our Connect4Community celebration, where we successfully brought together the brightest legal business professionals for a free evening of fun, games and giveaways. This summer’s Connect4Community is one of three London networking events held each year, designed to fulfil LSN’s mission to help connect professionals in our community with each other in a fun, different and meaningful way. Connect4Community saw LSN take over Bread Street Kitchen in the heart of the city and welcome over 300 guests looking to make the most of a Monday night. Alongside our sponsors, DX, Thomson Reuters Elite, Conscious Solutions, Accesspoint Technologies, Aderant and Brother, our sparkling attendee list was made up of 70 brilliant LSN networkpartner guests and 235 law firm professionals from 86 different firms, keen to make quality connections. Connect4Community’s re-energised structure, designed to start conversations and make networking less ‘work’ for our guests, saw the introduction of icebreaking activities from LSN’s new Crowd Connectors. Hundreds of professionals connected and collaborated in a code-cracking challenge, a space-themed VR station, a roulette table, a cocktail bar and executive lounges. A few lucky guests won prizes generously provided by our partners and sponsors. 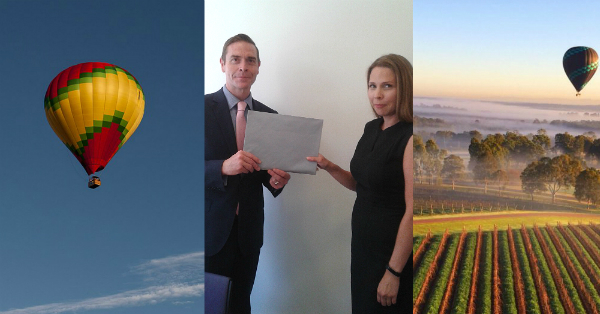 Clariece Warrior, professional ethics and compliance officer at Leigh Day, walked away with a breathtaking hot air balloon ride for two, sponsored by secure delivery experts and Connect4Community Platinum Prize Presenter and networkpartner, DX. LSN and DX visited Leigh Day’s London office today to present Clariece with the prize. “Having sponsored numerous London-based Legal Support Network events since 2015, we are absolutely delighted to have supported the inaugural Connect4Community networking event as a Platinum Prize Presenter,” said DX service department manager, Jonathan Ramsey. “With a keen emphasis on delivering exceptional connections and customer service, the parallels in vision and culture between LSN and DX Group are stronger than ever. It felt like the perfect fit for us to be a part of an event where the focus is firmly fixed on building, developing, and strengthening relationships between the business services departments within the legal community. As a first-time attendee to LSN’s networking events, Clariece considers herself a Connect4Community convert. “In SME law firms you may be the only person in your role, so building meaningful connections and swapping experiences with your counterparts from other firms is incredibly useful in understanding the changing legal sector landscape. There are so few networking opportunities where you can gain that kind of insight from business services professionals in both small and large firms, so LSN’s London Networking Events are a delightful and welcome rarity,” Clariece commented. “I wouldn’t have gained so much from it if it wasn’t geared towards my unique professional community this way. “Connect4Community was also a great place to put faces to names among firm suppliers I work with regularly and catch up with my colleagues in a fun and friendly environment. Networking was much less daunting when activities and interactive games break the ice and bring people together – I particularly enjoyed the roulette table on the night! LSN’s Connect4Community returns to London on Monday 12 November, but will next bring legal business professionals together on its regional circuit this autumn with October events in Leeds, Bristol, Birmingham and Manchester. For information on connecting with the brightest in legal business by sponsoring or attending any of LSN’s networking events, contact Felisha on 0870 112 5058 or felishad@burlingtonmedia.co.uk.